Two Fathers 4 Justice campaigners dressed as Batman and Robin were among 16 people arrested on Monday. The pair had mounted a rooftop protest outside Bristol County Court where Buckingham Palace protester Jason Hatch was attending a hearing. The men, a 34-year-old from Bristol, and a 52-year-old from west Wales, came down of their own accord. 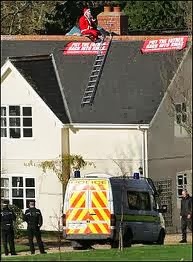 However, two more protesters, including one in a Spiderman mask, remained perched on the roof for most of the afternoon. Jolly Stanesby was dressed as Spiderman and Gary Swain is dressed in his decontamination suit. Meanwhile, a Fathers 4 Justice campaigner in a Spiderman mask and another in a decontamination suit protested from the roof of the County Court. The man in the decontamination suit was said to be there to "clean up" family law. They remained there for the afternoon, before coming down by late evening, when they were arrested. The other people arrested include 60-year-old Carmen Taylor from Bristol, and the campaign group's founder Matt O'Connor. Mrs Taylor said she was supporting her son, Nigel Clay, who said he was proud as his mother was placed into a police van after being arrested on suspicion of aggravated trespass. "My mother is an active grandma and sees how unfairly fathers are treated by the courts," he said. I T WAS a compelling spectacle. Someone dressed as Batman had breached the security of Buckingham Palace and was standing on a ledge protesting about fathers' rights. The demonstration was being broadcast live on TV. We watched as police officers tried to talk him on to a balcony. It would be difficult not to find this at least a bit amusing. Except that when you get past that initial response you realise that this is desperately sad. The father in question was Jason Hatch, a 32-year-old painter and decorator from Cheltenham, Gloucestershire. He unfurled a banner which read "Super Dads Of Fathers 4 Justice - fighting for your right to your kids". This was the second big headline-grabbing protest by a member of Fathers 4 Justice (F4J). On May 19 another campaigner set off a similar security scare when he threw harmless purple powder at MPs in the House of Commons. The controversy over royal security following Monday's stunt has put F4J back in the national spotlight, and that's just how they want it. It would be easy to dismiss these campaigners as a collection of aggrieved mavericks. It would be too easy to look no further than the comicality of a father dressed as a caped crusader who has scaled one of the nation's landmark buildings. But Jason Hatch was by no means the first to resort to such tactics. And the question that begs is this: why do these fathers feel they have no alternative in making themselves heard? Look beyond the obvious and this becomes a heart-rending and vexed issue of our times that touches on the lives of thousands of separating couples. The fathers feel as if they have been rendered almost invisible by the family courts. The group is campaigning for equality in law for both parents over access to their children following divorce. At present there is no legal assumption of access or shared custody. And all too often the big losers in all of this, the ones who often suffer most from the tug-of-love and rivalry between a separated couple, are the children trying to come to terms with it. The statistics highlight the scale of the problem. There were more than 147,000 divorces in England and Wales in 2002, the highest since 1996. Fathers 4 Justice calculates that 650 children a day have parents who separate or divorce - 237,250 children were affected in 2001. Forty per cent of marriages end in separation. That adds up to a lot of heartbreak and scattered homes. It is no longer just a problem for individuals, but it is so widespread that it is a major social problem. It is further compounded by the thorniness of the divorce and settlement process, involving Cafcass (the Children and Family Court Advisory and Support Service), the CSA (Child Support Agency), and the ensuing custody and access hearings. It means a father or a mother can lose thousands of pounds, even their livelihood, as the legal fees pile up. The disputes can continue for years without resolution. So, for these fathers, high-profile protests are the only way of getting wider society, the Government and the judiciary to take notice. The thinking behind F4j's peaceful "direct action" protests was adopted from Greenpeace. And they are starting to achieve results, with both the Government and the Opposition being forced to examine the reform of family law. Matt O'Connor, who founded Fathers 4 Justice in December 2002, explained: "We've got so many people wanting to join that we are struggling to cope." The seriousness of that message was underlined in July when F4J produced a document called A Blueprint For Family Law In The 21st Century: The Case For Urgent, Radical Reform. But why should it have come to this? Jolly Stanesby, 38, from Ivybridge, has been one of the most prominent and prolific of the F4J campaigners. He separated from his partner in 2000 and is seeking more regular contact with their four-year-old daughter. His protests have included three days atop a crane in Exeter last September, three days on London's Tower Bridge in December, and seven days up the Tamar Bridge in January. He explained: "What else can we do? If we didn't do it with some humour we'd be looked at as grumpy dads. "But really, this is not a funny issue. If someone had a conviction for hitting someone or beating someone up, then I could understand why they couldn't see their children. But there should be equal rights unless there's a good reason otherwise." Mr Stanesby believes the system needs to be simplified and a greater emphasis placed on mediation. Another Westcountry father, who has asked not to be named, explained the determination of the campaigners: "A parent's bond with their child is the strongest and most powerful they will ever have with anyone. It doesn't just end because the court says so." He has been campaigning for greater access to his six-year-old daughter. "I have to apply to see my girl, and I'm her father, yet there's no suggestion that I'm a threat to anyone," he said. "My ex-wife now has a new boyfriend and he can see my daughter at any time, without any checks. Where is the sense in that? "When I don't have access, I'm not allowed to write to her or phone her. This has been very painful for my daughter and it's all so unnecessary. "I've heard her crying at night and I've tried to explain as much as I can. But it's so difficult for a little girl, and why should she be worrying about these things?" On Monday: The WMN begins a major series looking at the debates and stories behind the protests, and the need for reforms.